Splenda is Getting a Bad Rap, But Does it Deserve It? Artificial sweeteners were created, in part, to address the problem of obesity. This epidemic, which defines the past two decades probably more so than any other health issue, has been blamed on two things in particular: lack of exercise and poor dietary choices. Obesity is blamed for the onset of diabetes, heart disease, and metabolic syndrome. It is estimated that billions of dollars are spent dealing with the fallout from an overweight and obese society, never mind the loss of quality of life for countless of individuals across the U.S. and Canada. Artificial sweeteners were invented to help people lower their average daily calorie count and to keep weight gain in-check. By avoiding sugar—which is high in calories—everyone should have been better off. Or so the thinking went when companies marketed their artificial sweeteners to the public. Not only adults, but kids too could reign in their caloric intake. But now, new research is suggesting that these so-called “non-nutritive” sweeteners may be responsible for some adverse health effects. Consider the recent controversy around “Splenda.” Splenda is made from sucralose, glucose, and maltodextrin. It has about one quarter the calories of a comparable portion of sugar. Splenda has been endorsed by a number of reputable organizations including the American Diabetes Association, the Food and Drug Administration, the World Health Organization, and Health Canada to name just a few. However, one recent animal study found that mice who consumed Splenda developed leukemia. Critics of the study say that the results may have been tainted by faulty quality control, data analysis, or less-than-sound experimental design. Another clinical trial found that Splenda increased body weight, decreased beneficial intestinal bacteria, and interfered with the absorption of nutrients and drugs. The results of this trial were evaluated by an Expert Panel who found that the researchers may have erred in their study results. They said that the study was deficient in several critical areas and that its conclusions that Splenda produced adverse effects can’t be interpreted as evidence or fact. Another research team from the Department of Health and Kinesiology at Georgia Southern University in the U.S. jumped into the recent debate and conducted a large-scale review. They searched multiple databases for any information regarding artificial sweeteners, non-nutritive sweeteners, non-caloric sweeteners, or sugar substitutes. These researchers were intent on covering all the bases! They found that the clinical data available was insufficient to make definitive conclusions about the benefits of artificial sweeteners for maintaining energy balance, decreasing weight, or reducing the risk for metabolic factors that lead to disease. These researchers suggested that artificial sweeteners may be useful as a dietary aid or to encourage blood sugar control in diabetics but with one caveat: like sugar, they should be used in moderation. We will have to stay tuned to this issue. Splenda was introduced in the 1970s and has yet to amass any significant studies showing that it causes adverse effects in humans. Researchers are still studying their data. For now, try using artificial sweeteners in moderation. Natural sweeteners such as cane juice, honey, maple syrup, agave nectar, and coconut sugar could be a healthier way to indulge your sweet-tooth without compromising your figure. Brusick, D., et al., “Expert panel report on a study of Splenda in male rats,” Regul Toxicol Pharmacol. October 2009; 55(1): 6-12. 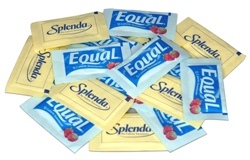 Schiffman, S.S., et al., “Sucralose revisited: rebuttal of two papers about Splenda safety,” Regul Toxicol Pharmacol. August 2012; 63(3): 5050-8; 509-13. Abou-Donia, M.B., et al., “Splenda alters gut microflora and increases intestinal p-glycoprotein and cytochrome p-450 in male rats,” J Toxicol Environ Health A. June 2008; 7(21): 1415-29. McLaughlin, K.J., “The Latest Controversy: Dr. Kevin’s Take on the Splenda Debate,” Foods4BetterHealth web site, June 20, 2013; http://www.foods4betterhealth.com/foods4betterhealth-reports-on-splenda-controversy-study-2635, last accessed July 17, 2013.